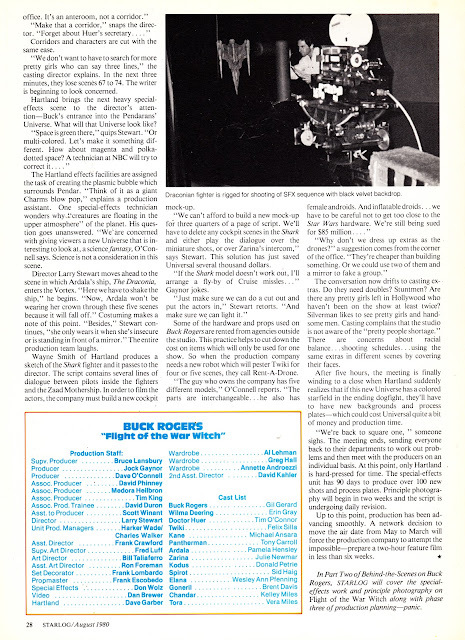 A few posts back, I ran a behind-the-scenes article on BUCK ROGERS IN THE 25th CENTURY, from Starlog Magazine (follow the Buck link below). 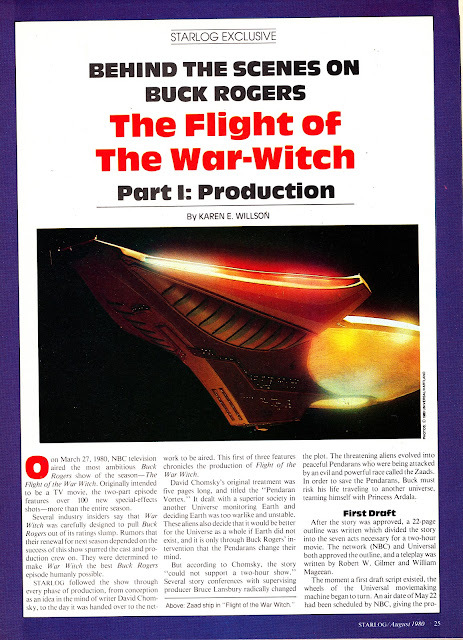 A few issues later, they followed-up with this three-part behind-the-scenes account of the making of the feature-length first-season finale FLIGHT OF THE WAR WITCH. 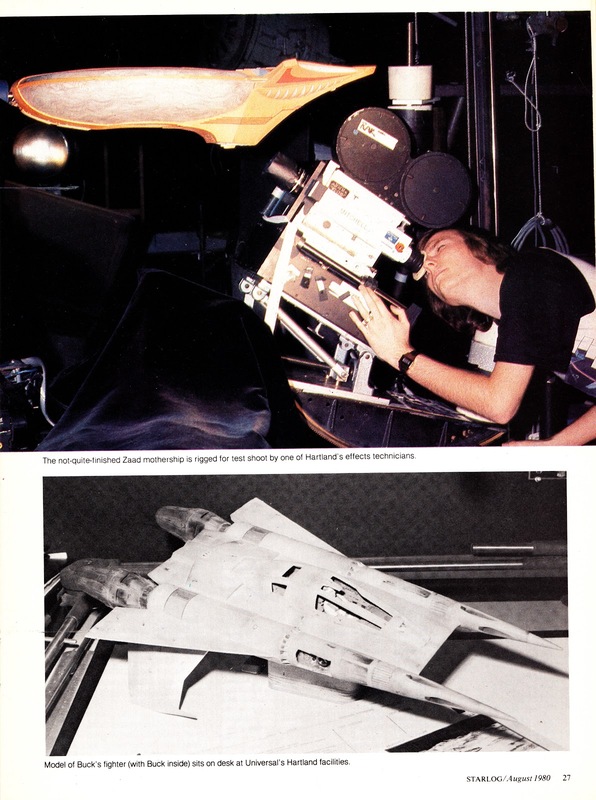 If you've ever seen the episode, you'll know that Universal really pushed-out the Starfighter to make the most spectacular finale they could. I'm sure the studio was looking to NBC for renewal and wanted to impress with a big-budget, highly promotable (I've run the TV GUIDE ad for War Witch in a previous post as well) conclusion to the season. Buck's ratings were not brilliant (not bad... but not a sure-fire renewal either) so Universal were certainly keen to avoid another Battlestar-like fiasco of a one-season wonder (and too few episodes to successfully syndicate). Not only is War Witch blessed with a healthy budget and copious new effects work, it also brings back the always delightful Pamela Hensley for her last fling on the show (the radical retooling of Year Two left no room for her recurring villain status). I'd seen the episodes (I think they've always been split into two parts in the UK) on their initial ITV run and the eighties repeats on BBC TWO but it only struck me when I saw it again on DVD: I think Universal had half-a-thought to release this theatrically overseas as a sequel to the pilot episode/ feature film. The box office revenue would have helped offset the extra production costs (Universal clearly made the same calculation with the Battlestar episodes that - when glued together - formed MISSION GALACTICA: THE CYLON ATTACK) but, for whatever reason, it didn't happen. It's a three-part article which I'll run over the next few days. 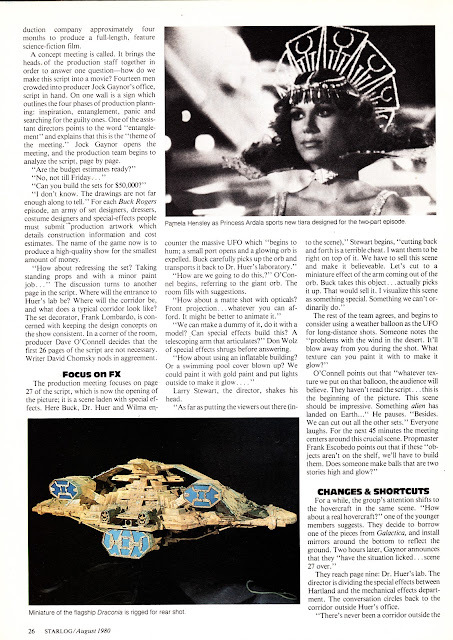 This first part ran in Starlog issue 37, cover-dated August 1980.